There are a variety of ways the results are presented and disseminated including project reports, newsletters, media reports, presentations at academic conferences, and publications in academic journals. Hobbs, L, Herbert, S., Jones, M., Campbell, C., Chittleborough, G., Kenny, J., Redman, C., & Goilbert, A. 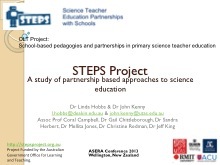 (2014) Science Teacher Education Partnerships with Schools (STEPS): Informing and guiding practices in university-school partnerships. Paper presented to the Contemporary Approaches to Research in Mathematics, Science, Health and Environmental Education, Deakin University Melbourne, 28-29 November 2014. Hobbs, Jones, King, Chittleborough, Redman, Campbell, Kenny, Herbert (2013). 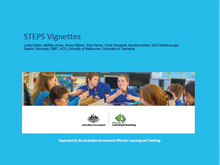 Science Teacher Educator Partnerships with Schools (STEPS): Developing an Interpretive Framework for Primary Science Teacher Education. Presented to the Contemporary approaches to Research symposium, 2013, Deakin University. Kenny, J., Hobbs, L., Jones, M., Chittleborough, G., Campbell,C., Gilbert, A., Redman, C., and Herbert, S. (2014). 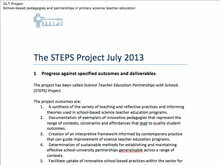 Science Teacher Partnerships with Schools (STEPS): Project-Partnerships in science teacher education. Australian Journal of Teacher Education, 39(12), 43-65. Kenny, J., Redman, C., Hobbs, L., Jones, M., Campbell, C., Gilbert, A., Chittleborough, G. and Herbert, S. (2014). 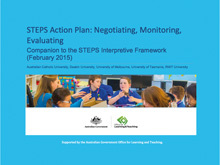 Developing effective school and university partnerships for teacher education. In Proceedings of 6th Annual EduLearn Conference on Education and New Technologies, 7th-9th July, 2014, Barcelona, Spain. 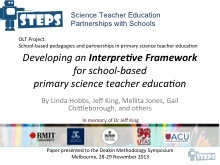 Jones, Hobbs, Gilbert (2014) Growing University-School Partnerships in Science Teacher Education: An Interpretive Framework. Paper presented to the ASERA Conference, July, 2014. Hobbs & Herbert (2014) School-based approaches to pre-service primary science teacher education resulting in gains in confidence. Paper presented to the ATEA Conference, July 2014. Hobbs, L., Jones, M., King, J., Chittleborough, G., Redman, C., Campbell, C., Kenny, J., and Herbert, S. (2013). Science Teacher Education Partnerships with Schools (STEPS): Developing an Interpretive Framework for Primary Science Teacher Education. Paper presented to the Contemporary Approaches to Research in Mathematics, Science, Health and Environmental Education, Deakin University Melbourne, 28-29 November 2013. Online proceedings, yet to be available.